Ask fellow campers about "Hot Springs Campground" and nearby attractions. Stayed the weekend and the Campground Rules WERE NOT enforced-Dogs were allowed to run free and were urinating in our campsite, campers were still loud and rowdy after the "quiet time" curfew, cars driving way too fast inside the park. I complained to the management and nothing was done. Most campers had NO campground etiquette and management did not care. This was not an enjoyable camping trip for us and will not be returning. My suggestion is that is you are looking for a quiet campground, stay away from Hot Springs Campground. We camped at Hot Springs Campground in a Tent Trailer. "Campgrounds - mud hole, no wifi, no view of river"
Great place for events. If you know everyone else, you won't mind being jammed into this mud hole. Getting off line here is a snap; no cell or wi-fi service. Dog-friendly campground. Very few rules. The staff was nice and did the best they could with what they had to offer. Campsite was tiny, unmarked mud, with very little space, and no privacy between it and the next unit. So close that our neighbors had to move their truck so we could have a campfire inside the ring. Mud surface to park in; NO gravel. Roads full of pot holes. No landscaping. Your "view" is the side of the next camper. No or direct access of the river from the RV sites. Had to go thru another person's site to find a long trail down to the river.To call the RV sites riverside is false advertising. To say they have Wi-Fi is false advertising; maybe SOMEWHERE on the property it was working, but not in the campground. Staff admitted they'd "been having trouble". Our opinion is the owners (in Chicago!) need to invest more $ into more band width for a business. Either that, or advertise "spotty wi-fi". Used to be one of the best chef's in NC at their store. Not so anymore :(. This place has a corner on the market, and its obvious the way they keep it. We camped at Hot Springs Campground in a Travel Trailer. Day trip to Max Patch (Google it). Great hike!! What a poor value. First the campground is mostly dirt. Very little grass to be found. The roads in the campground are full of holes and are mostly first. When it rains so it did yesterday they turn to mud. At $40 per night a totally overpriced campground. It was hard to know where your campsite ended and another one started. We camped at Hot Springs Campground in a Fifth Wheel. No grocery stores in town only convenience stores. This park was in a great location. Walking distance to downtown Hot Springs and the spa. The Appalachian Trail goes through the town and along the river, so I was able to accomplish a goal by "hiking" the AP. The bathhouses were minimal, but not a problem since there were sewer hookups. Great little town and beautiful location so we would probably stay here again. We camped at Hot Springs Campground in a Motorhome. Very nice park along the river: quiet and restful. Hiked way back in the campground along the river. Good place to eat: Iron Rail. There is a very neat Craft Gallery next door. Not much else, but relaxation in the Hot Springs across the road. Campground is very clean. Love to come here as much as possible, especially in the winter to enjoy the tubs. We camped at Hot Springs Campground in a Fifth Wheel. This is my first post and I am really sorry it has to be a negative experience with Hot Springs and Spa resort in North Carolina on the French Broad River. We advanced paid for camping on the best (so called) full hook up site on the French Broad river. Site 443. Right next to us is the deluxe camping for tents which means they have water and electric but must be in tents. The campground itself was good however, the streets were very muddy in the rain and very dusty when it didn't rain. They could have used some gravel in the roadways to help with that situation. The tent campers seem to have big dogs that were barking a lot and defecating around the sites. Some owners would pick up the waste, others laughed about it and didn't pick it up. The security gate/guard was a joke. Anyone could come into the campground any time of the day. Some folks we saw went to the back of the campground were naked in the river swimming. We had a family emergency which made us leave in haste and basically forfeited our camp fees . We paid $562.00 for 2 weeks and stayed here only 5 days. The down side of this whole situation. We had made reservations in the spa resort part for a massage and hot tub which would total $225.00 for my wife and myself. I called as soon as I could and tell them I couldn't do the spa and massage due to this family emergency and they charged my credit card $200.00. When we signed up for the spa they did not tell us anything about a cancellation policy or anything in writing. So needless to say, we are disputing the $200.00 charge. So stay away! 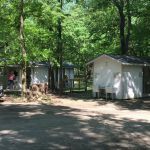 We camped at Hot Springs Campground in a Travel Trailer. This is a beautiful park, and has the potential to be a great place with a little TLC. For example, the bathrooms were cleaned daily, but the cleaning people never look up. There were spider webs and bugs in the ceiling of an otherwise clean facility. After the a holiday weekend, they didn't empty the dumpsters until Thursday. There are a few pull-through sites that have 50 amp, but the other sites are 30. They do have river front sites, but with the thick undergrowth, you can't see the river from most of the RV sites. There is also a train track next to the campground, and the train blows the horn when it comes through. After a couple of rain showers, the roads were a muddy mess. The spa across the street is nice, and there lots of outdoor activities nearby. It's also close enough to make a day trip to Asheville or Pigeon Forge. Verizon cell phone coverage was ok, but the aircard was almost unusable because it was so slow. There was no AT&T coverage available. We camped at Hot Springs Campground in a Fifth Wheel. This is a wonderful campground filled with trees and reasonable room between sites. The hot mineral springs are across the street for soaking and massages. This is in mountain driving the last 15 miles, but good roads and no problems for big rigs. We enjoy fewer amenities and beautiful areas. We will definitely return. White water river rafting, small mountain towns, etc. We camped at Hot Springs Campground in a Motorhome. Are you affiliated with Hot Springs Campground ?